LINC recently completed baseline research in the Goma and Bukavu municipalities of eastern DR Congo, assessing social capital and accountability for public service utility provision utilizing Social Network Analysis (SNA). The objective of this SNA research was to facilitate understanding of formal and informal networks for collaborating, resolving issues and influencing decisions related to water and sanitation service provision at the local, municipal, provincial and national levels. The overall public service governance network is sparsely connected and fragmented. 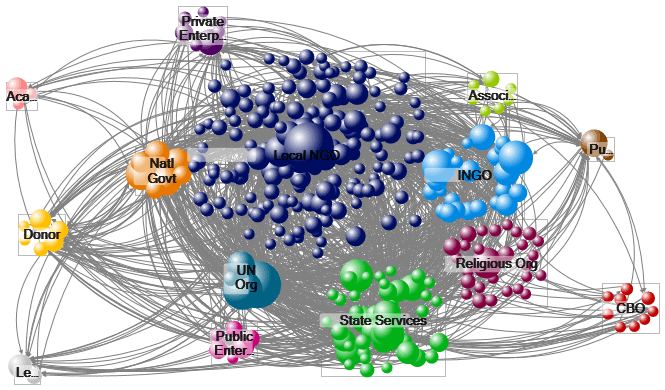 Although smaller subgroups of organizations within the network are working together, these groups are somewhat disconnected within the context of the larger system. It might benefit the network overall to work on both bridging and bonding social capital ties, first working on building strong partnerships within sectors or types, and then facilitating introductions across these groups. Local NGOs composed the largest group of actors working on public service governance in the Goma and Bukavu municipalities. They are well positioned to bridge across the network, but constrained in their levels of influence. Community Based Organizations (CBOs) were found to have weak presence in the network with a small overall population, very little bonding social capital among them, and most of their activities focused on the health sector. The baseline report, completed in the summer of 2016, presented a series of findings and recommendations to be incorporated into the design, monitoring and evaluation of interventions undertaken by the DFID-funded IMAGINE project implemented by Mercy Corps in Goma and Bukavu municipalities. A follow-up SNA of the same actors will be conducted at the program’s mid-term in 2017 and final evaluation using the SNA method conducted in 2019 at the program’s conclusion.